Intelligence is the ability to acquire, remember, and use knowledge in order to make judgments, solve problems, and deal with new experiences. Not every student will have the experience of taking an I.Q. (intelligence quotient) test. However, almost all students do know what it is like to take a standardized test. Unlike a test taken for a class, which usually is based on specific material already covered in the classroom, standardized tests typically include a wide range of items that ask the test-taker to use words, solve problems, and understand relationships among concepts. The results often show how the student performed compared to others of the same age or grade level. For example, if a student scores at the 80th percentile, that means this person performed better than 8 out of 10 students of the same age or grade who took the test. I.Q. tests are used to compare an individual's performance to that of others on a sampling of school-related tasks. An individual's performance on all these tasks is averaged and compared to that of other people of the same age. I.Q. varies among people much the way height does. Most people are close to average height, while a small number are much taller or shorter than average. Similarly, the average I.Q. is 100, and most people fall somewhere between 70 and 130. Those who fall below 70 often are diagnosed with mental retardation, while those with an I.Q. higher than 130 often are considered gifted. How did the practice of measuring intelligence get started? Back in 1905, public school administrators in Paris asked psychologist Alfred Binet to come up with a test that would identify mentally retarded children who could benefit from special help outside the regular classroom. It was hoped that this would help relieve the problem of overcrowded classes. The Simon-Binet test that resulted set the stage for intelligence testing throughout the 1900s. An American psychologist at Stanford University named Lewis Terman revised the Simon-Binet test in 1916. This revision, known as the Stanford-Binet Intelligence Scale, is still in use today, although it has been revised several more times. The latest version includes sections on abstract/visual reasoning, verbal reasoning (word-related problems), quantitative reasoning (number-related problems), and short-term memory. In th early 1900s, it was widely believed that gifted people were physically inferior, had unusual interests, and found it difficult to relate to others. In the 1920s, psychologist Lewis Terman and his colleagues at Stanford University launched a study of 1,500 children in Califrnia who were gifted (I.Q.s over 130). After tracking the children for several years, the researchers found that they actually were heal taller, better adjusted, and more popular than the average child. As these gifted children grew into young adults, they were more liely to attend college, achieve acadernically, pursue advanced degrees, and go on to h i g h e l professional positions in fields such as science, writing, and business. They also tended to be more satisfied with their lives as adults. This dispelled the notion that extremely bright people were "eggheads" who were at a disadvantage socially. It also suggested that I.Q. may be a somewhat reliable predictor of later academic and professional success. At the same time, however, the study showed that a high I.Q. is not a guarantee of success, as there were also many individuals who did not achieve at a high level. While many of the "gifted children" were well educated and had good professional jobs, all levels of employment and income were found. The Wechsler Intelligence Scales are another well-known set of I.Q. tests. Psychologist David Wechsler developed a number of tests in the 1940s, 50s, and 60s that were tailored to children of different ages as well as to adults. Today, many schools use the Wechsler Intelligence Scale for Children-Third Edition (WISC-III) to evaluate children between the ages of 6 and 16. One of Wechsler's contributions is the notion that intelligence can be broken down into two main types of problem-solving: verbal and nonverbal. A Verbal Scale on the WISC-III measures how well children are able to use words to solve problems of different kinds, including some that involve common sense and others that involve more abstract reasoning. The Performance Scale on the test measures how well children use nonverbal abilities to make sense of visual relationships; for instance, by solving a puzzle or deciphering a code. Intelligence is sometimes classified as left-brained or right-brained, although that is an oversimplification. 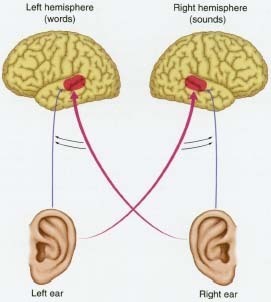 People can hear words and musical sounds with both ears, but the right ear is believed to have a stronger connection to the left hemisphere of the brain where words and speech are processed. People can hear words spoken into the left ear but they understand them better when assisted by the speech pathway from the right ear. Likewise, the left ear has a stronger connection to the right hemisphere of the brain where musical sounds are processed. People can hear melodies played into the right ear but enjoy them more when assisted by the sound pathway from the left ear. Gardner also believes that any definition of intelligence must take into account what the culture values. For example, while we might consider someone intelligent if that person can use words or numbers well, people of another culture might place more value on skills such as hunting, fishing, or understanding nature. Gardner's theory favors observation of people over time, rather than short-answer I.Q. tests, for measuring the different intelligence types. Other psychologists have suggested still other theories for understanding intelligence. Swiss psychologist Jean Piaget, believed that intelligence should be defined as adaptation to the environment. Piaget looked at how children display intelligence at different stages of life, from infancy through adolescence, and tried to make generalizations about how they are able to cope with their surroundings and meet new challenges. More recently, psychologist Robert Sternberg proposed a three-sided theory of intelligence, arguing that intelligence actually is composed of three parts: the ability to analyze information to solve problems, the creative ability to incorporate insights and new ideas, and the practical ability to size up situations and survive in the real world. Most likely, all of these theories are at least partly correct and can contribute to our overall understanding of intelligence. However, updated versions of the tests developed by Alfred Binet and David Wechsler still are used to measure I.Q. Many psychologists and educators have strong feelings for or against giving I.Q. tests. Some argue that I.Q. tests are very useful for predicting how well a particular child will do in school and judging whether that child needs extra support or more challenges. However, others fear that children who test poorly may be stereotyped as low achievers and not given the level of attention they otherwise would have received. Still others believe that specific test questions put individuals from certain ethnic groups at a disadvantage. For example, think about how some of the verbal expressions used by African American or Latino students differ from those used by their caucasian classmates. A verbal question that asks about a particular word that is commonly used by people of one ethnic group might be unfamiliar to people from other backgrounds. Finally, some experts are concerned that I.Q. tests may underestimate the abilities of people with speech, movement, and other disabilities. National Association for Gifted Children, 1707 L Street Northwest, Suite 550, Washington, DC 20036. A national organization for parents and teachers that focuses on the special needs of gifted and talented students. U.S. Department of Education, 400 Maryland Avenue Southwest, Washington, DC 20202. The department of the federal government that oversees special education programs for mentally retarded and gifted students.